Women in Saudi Arabia have taken part in an election, both as voters and as candidates, for the first time. Seventeen women and 54 men are competing for the 12 seats on the board of the Chamber of Commerce in the Saudi business capital, Jeddah. Voting takes place over four days - for the female candidates voting was on Saturday and Sunday, while voting for the men is on Monday and Tuesday. A BBC correspondent says the vote is seen by liberals as a sign of progress. BBC Middle East analyst Roger Hardy says the election is of great symbolic importance in a conservative country where women's lives are restricted in many ways. Our correspondent says women's activists are trying to put a brave face on the fact that the turnout at the weekend was low. But they are hoping some of the male voters will support their candidates. By Saudi standards, the chambers of commerce are modern, liberal institutions. They have long prided themselves on the fact that they conduct often strongly contested internal elections. 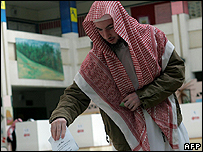 But in general, voting is still a novelty in the kingdom - and for the many Saudis who want reform, progress has been painfully slow, our correspondent says. Eight months after elections for municipal councils - polls which were an all-male affair - the councils have yet to meet. King Abdullah has made the promotion of women in society a priority of Saudi Arabia's 2005-2009 development plan, but the authorities have emphasised it will have to be in line with what they see as the principles of Islam.